Content marketing is an emerging area of marketing focused on creating smart, useful, and fun content, like blog posts, videos, infographics, and social media posts. Content is created to meet specific goals and is measured to track success. The majority of business to business companies are using content marketing. Consumers are responding positively to content marketing efforts; 90% of consumers find custom content useful. Plus, it helps build a connection between the company and consumer. These are the same consumers that visit your library every day! 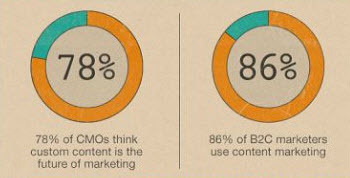 Find more content marketing stats in The State of Content Marketing infographic. Take a cue from the business world, and learn from their successes and failures to develop and optimize a content marketing program for your library. Don't miss the next post. We'll step away from the business world and discuss content marketing for libraries. -- How do you Measure Content Marketing?